I might as well kick off discussion here on this system which could develop later in the forecasting period and turn back towards the coast. I have cut and pasted my last post from the general thread here. Access-G the ultimate tease has the monsoon low returning as a cyclone on WBB/SC's doorstep next Monday. GFS kills it in the SW Pacific. EC has it returning but stalling a fair way off the east Aus coast. Big ridge weakness from 168hrs. All models show it (even the latest ACCESS-G). Don't like this one's chances of making it anywhere near the Queensland coast honestly. ACCESS G gradient wind pattern has the coral sea low merging with the other TS/low to its east, this week. If you watch the 7 day animation the animation show an amazing pattern of the the 2 lows doing a fujiwarra until they join. Then its a massive system in the coral sea and Nth Tasman. Cool animation there Crikey. Will be watching with interest. TEMPERATURES ARE FAVORABLE (2830C) IN THIS PORTION OF THE CORAL SEA. Looks like a ridge tries to re-establish itself after the upper trough affects this system for a couple days in a weeks time. Take this one with a pinch of salt - way too far out to have any real bearing - but an indicator that things could get interesting somewhere on the coast in the next couple of weeks. What run is that from, Kev? None of the EPS ensemble members from 12z show this at all. Or, is this beyond the 240hr timeframe? Yeah, looks as if it stays shallow enough to not get pulled away by the shortwave. That model says 24/2. Guess it’s the 14 Day. Less reliable, but definitely shows some promise and something to look out for. Gee, that's GFS extended territory. Think I'll pass on that until we get closer lol. It’s the EC 14 day forecast. Obviously in la la land but worth posting to show the potential. EC can be good at this longer range stuff - not the detail but a heads up that something can be worth watching. Himawaricast image from Jcsat2B at 0600UT. The latest EC is more interesting for its upper steering pattern (an amplifying short wave trough) that drags a small but rather intense TC SW towards SEQ (but well offshore at the end of its run). This brings it into alignment with several other models including Access-G, JMA, and ICON. A long way out where anything can happen. The Coral Sea is notorious for its difficulty in long term tropical forecasting, but it's noteworthy that there is consensus of sorts this far out. The latest JTWC analysis has upgraded 96 Invest to medium. I must say it is looking far better organised this afternoon despite unfavourable shear. (1) THE AREA OF CONVECTION (INVEST 96P) PREVIOUSLY LOCATED NEAR 17.4S 156.4E, IS NOW LOCATED NEAR 15.8S 160.3E, APPROXIMATELY 837 NM EAST OF CAIRNS, AUSTRALIA. ANIMATED MULTISPECTRAL SATELLITE IMAGERY AND A 102259Z AMSU 89GHZ IMAGE DEPICTS A BROAD BUT WELL ORGANIZED LOW LEVEL CIRCULATION CENTER (LLCC) WITH FLARING EXPANSIVE DEEP CONVECTION OVER THE CENTER. A 102301Z ASCAT PASS TO THE WEST DEMONSTRATES HIGHER, 30 KT STRAIGHTLINE WINDS TO THE NORTH AS PART OF THE SOUTH PACIFIC CONVERGENCE ZONE. 96P LIES IN AN AREA OF UNFAVORABLE (30-40 KNOTS) VERTICAL WIND SHEAR, BUT GOOD POLEWARD OUTFLOW IS SUSTAINING CONVECTION. SEA SURFACE TEMPERATURES ARE FAVORABLE (28-29C). GLOBAL MODELS AGREE ON AN EASTWARD TRACK AND DEVELOPMENT IN THE NEXT 24-48 HOURS, WITH THE HIGHER WINDS WRAPPING AROUND TO THE SOUTHERN SIDE OF THE CIRCULATION. MAXIMUM SUSTAINED SURFACE WINDS ARE ESTIMATED AT 20 TO 25 KNOTS. 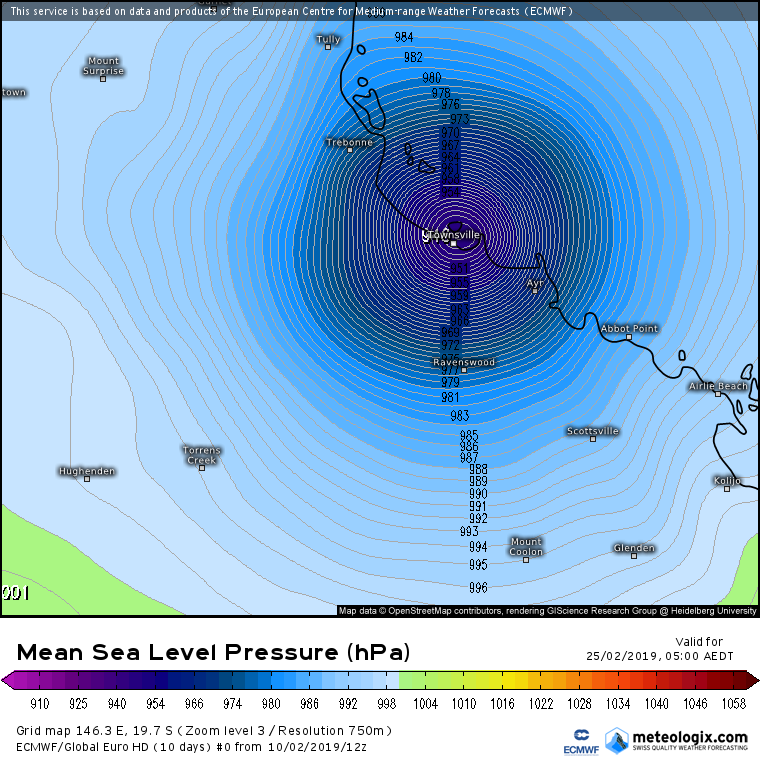 MINIMUM SEA LEVEL PRESSURE IS ESTIMATED TO BE NEAR 997 MB. THE POTENTIAL FOR THE DEVELOPMENT OF A SIGNIFICANT TROPICAL CYCLONE WITHIN THE NEXT 24 HOURS IS UPGRADED TO MEDIUM. Starting to look more and more likely that the low that wreaked havoc across NQ last week will become the most dominant low again along an active monsoon trough in the Coral Sea. Only this time, she may even get a name. Still a long way off though. GFS has it as a TC in a coupe of days time. As a side note, the Gulf flooding in that pic is INSANE. Yeah, same with EC. Biggest difference in those two models at that point in time is a second circulation which, as usual, GFS morphs into a baby TC which then initiates the Fujiwhara dance with the main low. EC/ICON just wash that second circulation out while the main low continues on its track west or southwest (much more likely scenario imo). I have been watching that postulated dance of the lows on several models now for a few days. If such an interaction does eventuate or just remains a possibility then I would say this is a situation that the models will struggle with. More so than the usual limitations of model skill at different lead times. 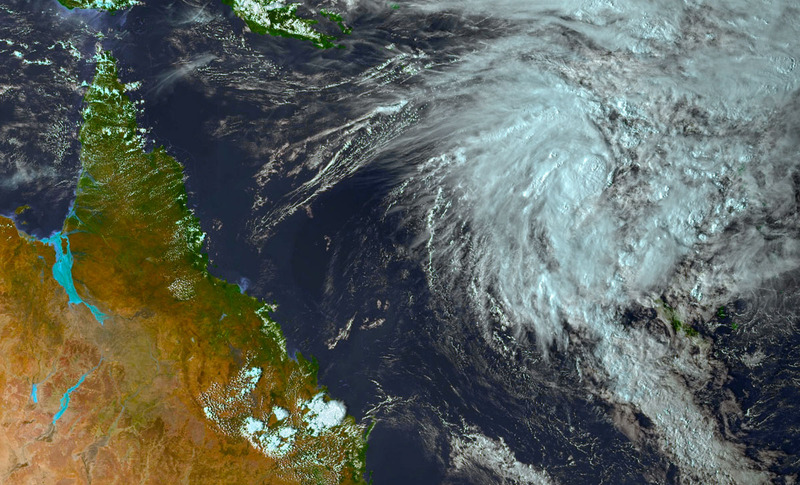 Something cooking beyond the coral sea and australian area of reporting appears to have been on the cards for a while but what that may be still seems quite uncertain. 9 registered (mysteriousbrad, Farra, Dr Philosophy, gleno71, Rhys., gberg, drivenunder, 2 invisible), 55 Guests and 2 Spiders online.